It's been a long, hot, but lovely summer here. It's still very warm today, but the diference is the leaves changing colors and the warm breezes making them spiral and dance to the ground. 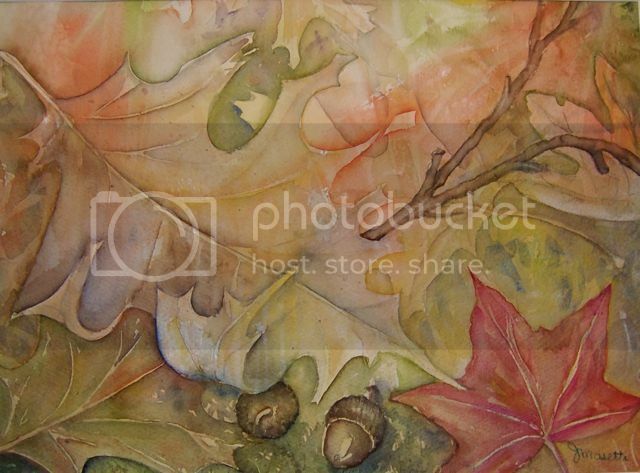 I gathered a bunch of leaves, twigs and acorns last week, and fashioned them into a painting to record the season. I just love the colors of fall and the seasons never bore me. They only heighten the senses and prepare us for what's to come. Don't you love the fall season? Aww, I always love your pictures. I am sorry I rarely reply, but I always enjoy your entries very much. Your pictures have wonderful things. I love the spring season most. I like the fall season, too. The best season to do various things. Thank you ria2. So happy you enjoy them. And it's wonderful to get a reply.